You need to give some joy to your room and you don’t know how? this may be it’s a good solution, that combines the ease of construction of the traditional tables made of pallets, with a more striking design. Viewing the first picture it’s easy to know how we have to build this table, anyway here I have a little step by step guide if it’s still not very clear for you. We have to get 3 pallets to start to build this table and various colored paints. No, I’m not going to paint the table of a pink color, this is just a primer did with a special paint, later we are going to apply another color and the result will be better. I chose the yellow, blue and black colors, we only have to fully paint the pallets as you can see in the pictures. To separate the last pallet from the floor I purchased these rubbers with nails. We just have to nail them under the table and then it will rise slightly over the ground. To place a glass over the last pallet it’s also advisable to put some rubbers. You only need to fix these special pieces creating some holes as you can see in the picture above. Okay, once we have placed the rubbers on the pallets, we can and put them on top of each other and form the table. The last step will be to place the glass top table. 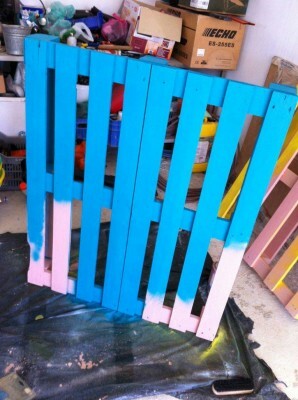 Do you like this DIY pallet cheerful coffee table? 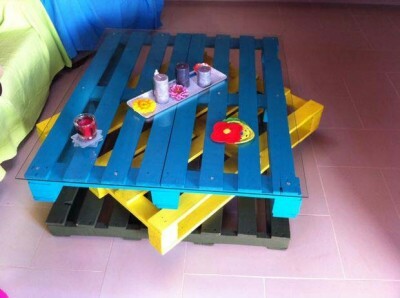 Do you want to look for more DIY pallet tables?